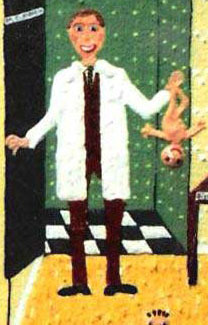 art, art blog, artistic inspirations, artwork, cabbage patch, ceramic, giclee prints for sale, Hans Christian Anderson, mosaic, Painting, paintings for sale, pregnancy, pregnant, sculpting, sculpture, sculptures for sale, stork, The Storks, where do babies come from? I bet you all know where the inspiration for this painting came from, yes of course being pregnant and all that. Seems like a long time ago now and a time filled with excitement and trepidation. I cannot say it was a great state to be in as feeling sick and fat are not two of my favorite experiences; however the outcome which was two beautiful and healthy babies certainly was, and they have been my inspirations for countless of artworks both paintings and ceramic and mosaic sculptures over the years. The art of making babies! Why is it that when you are big and fat with a belly full of baby everybody wants to touch your stomach, however when I am in peak condition with a six pack and really would like to show that off, no bugger is interested in feeling my tummy, why is that? 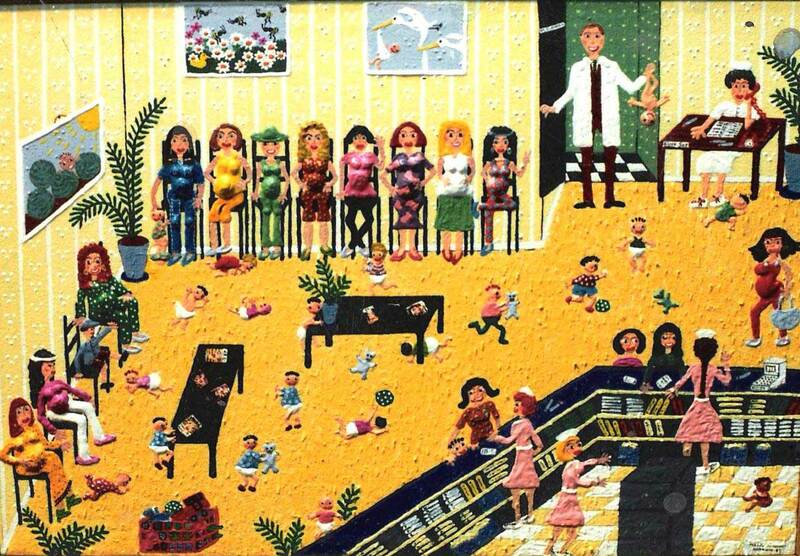 In this painting you can see my Doctors waiting room, Dr Jack a wonderful friend apart from being a great obstetrician and his lovely offsider Sister Sue. You may also wonder why a few of the pregnant ladies are looking so grumpy – well let me tell you. It’s not bad enough that you have a baby pressing on your bladder for 9 months but every time you go for an ultrasound they make you drink 2 liters of water (and no matter how busting you are, you are not allowed to go to the toilet.) So imagine that a whole waiting room full of ladies wriggling around on their chairs totally unable to sit still, as if that’s not bad enough! Oh no when its finally your turn (and don’t hold your breath) then you have to lie down and endure a very cold & gooey probe being pushed all around on top of your stomach, before you are finally allowed to sprint off to the toilet (or waddle lol whatever the case may be). I for some reason also thought that being pregnant was a “free for all” in eating and managed singlehandedly to stack on 25 kilos during that time, seemed more like I was having a baby elephant than anything else. Shame too that I couldn’t even blame the weight on the baby as both of my darlings were quite tiny when they arrived. Really lucky that I was able to get my own body back after all that, as the one I borrowed (so to speak) seemed more like a strangers, lol. So where does babies come from you may ask…. Well there are many theories about this, could it be the birds and the bees or perhaps the baby was found behind the gooseberry bush or in the cabbage patch? Now I will have to subscribe to the idea that babies are really delivered by the stork as when I did a bit of research on this matter I discovered that some say the myth originated from Scandinavia who believes storks are gentle birds with strong family ties, although this myth does have some competition from both Germany and Holland. Acclaimed author Hans Christian Anderson’s tale “The Storks” from 1838 tells a gruesome tale but I prefer to look on the bright side of life and think that Storks are a fertility symbol and associated with springtime and birth. They are also a symbol of good luck and used to actually nest on top of roofs. So I guess that’s maybe how the folklore got started; some embarrassed mum or dad when asked where babies came from, pointed at the stork on the roof sitting next to the chimney, and it would have seemed almost believable! Well especially as we all know that Father Christmas uses that entrance too. So here is a joke I found from the storks point of view. “Two storks are sitting in their nest, a father and baby stork. The baby stork is crying and the father stork is trying to calm him. “Don’t worry son, your mother will come back she is only bringing people babies and making them happy. The next night it’s the father turn to deliver, so mother and son are sitting in the nest, and the baby stork is again crying with the mother saying “Son, your father will be back as soon as possible, he is just bringing joy to new mommies and daddies. A few days later the stork parents are desperate, their son has been absent from the nest all night. When finally shortly before dawn he reappears – and they ask where he has been all night?